What type of sinks does your RV have? Are your sinks discolored, stained or chipped? Are they big enough for your needs? Do you have built in sink covers? Do you want them? What is the condition of the RV shower faucet? Does your RV shower faucet drip? How does the shower faucet hose look? Are you getting solid water pressure? Are you already planning to replace the counter tops? 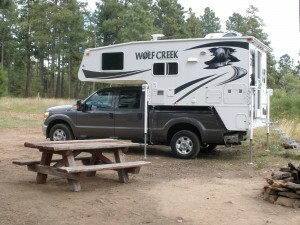 Take stock of your current RV conditions. What do you like and dislike about what is currently installed? 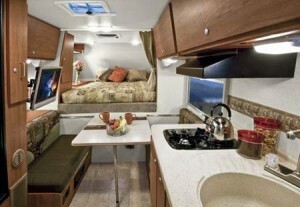 If you’d like to upgrade your RV from the cheap feel of a camper, start by replacing the plastic sinks. Plastic sinks are usually located in inexpensive RV interiors. 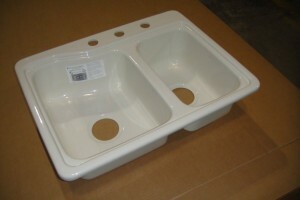 Plastic RV sinks range from $12.00 – $20.00 USD depending on the style and size. This is a great place to spend a little extra to enhance your space without a lot of hassle. Plastic sinks are lightweight and inexpensive. If you don’t mind having a plastic sink, you can buy a new one that is free from cracks, dings and stains for under $20. (And that is $20 well spent!) It’s a great way to update a used trailer. Stainless steel provides an easy-to-clean sink option. 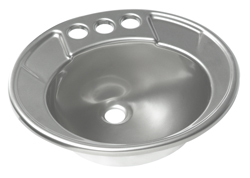 Stainless sinks are easy to sanitize and are available in a variety of shapes and sizes. You can choose from single or double sinks, squared or rounded shapes or a corner-style. Stainless steel sinks use metals, such as nickel, to protect against the elements. These sinks are stain-resistant, but can scratch and (may on occasion) dent. 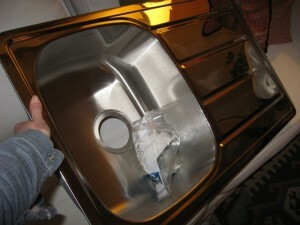 Many RV owners enjoy stainless steel RV sinks because they are easy to polish and keep shiny. They also provide a true residential feel at an affordable price. MSRP on stainless steel RV sinks range from $40 to $150 depending on the size. Stainless steel sinks use specialized stainless cleaner. Be sure to check the ingredients and make sure they are safe for your gray tanks. 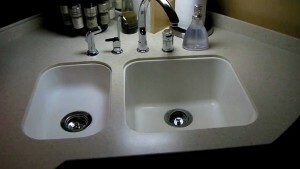 Acrylic RV sinks simulate solid surface and are a step above the plastic. Acrylic sinks are heat-molded and backed with fiberglass. They come in tons of colors and provide protection from chipping. Dings can be easily repaired as the sinks are the same color all the way through. An acrylic RV sink will resist stains in most situations. Prices on Acrylic RV sinks range from $40 to $150 depending on the size and style. Solid surface sinks make you feel right at home. 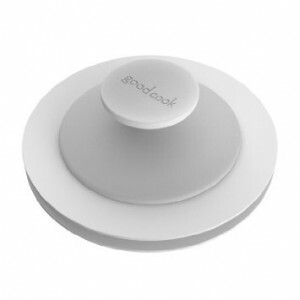 They are an upscale option that became more and more popular in recent years. Solid surface means the sink is chemically-bonded to create a smooth, unified, one-piece look. You avoid grout lines and areas where bacteria and mold can gather. A solid surface RV sink features consistent pattern or colors such as stone, granite or quartz style. These sinks are easy-to-clean and resist penetration and stains. 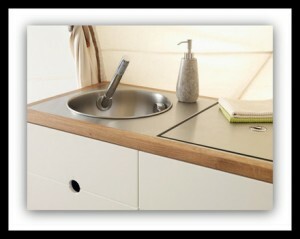 Solid surface sinks provide an upscale look and feel for your RV. Prices range from $75.00 to $500 and remember, these sinks need professional installation. 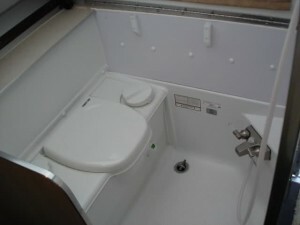 A unique feature of many RV sink styles is RV sink covers. These covers also come in a variety of styles. When buying a sink, be sure to ask if the sink comes with the option of fitted sink covers. 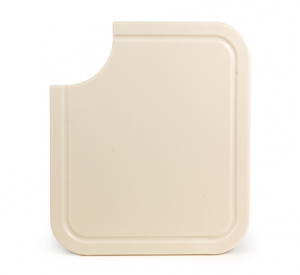 If not, you can buy a set of aftermarket RV sink covers that work for cutting boards or drying racks. 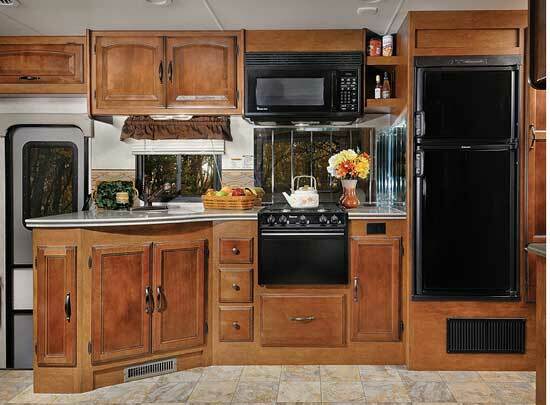 Living the RV life means that each item you own needs to offer a variety of functions. An RV sink should provide you with counter space and sink space at the same time. Another question worth asking is, “Should I install a single, double or corner-style sink?” Just because your RV currently has a single-style sink, it doesn’t mean you have to stay with that. Many campers appreciate the space of an RV double sink when it comes to handwashing their dishes. 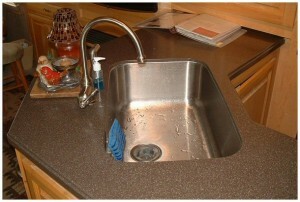 Others like a deep RV sink and use a wash basin, inside the sink, to separate dishes while washing. RV corner sinks can come in handy if you have an L shaped or back corner kitchen. A corner sink may allow you to access the sink from more than one direction. Finally, some trailers have tiny bathroom sinks within their toilet/shower combo. 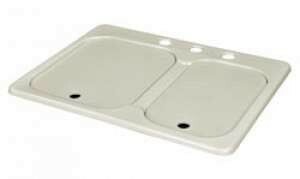 This type of RV sink is also available online, and comes in a variety of classifications and price ranges. RV sinks need specialized parts. Standard home stoppers, strainers and pumps can be worthless. Instead, ask your RV supplier about RV sink parts that work with your new sink. Do they offer add-ons or options? Always read the reviews before buying a new RV sink. Ask around to what sink other people like and why they like them. Now, let’s move on to RV shower faucets. 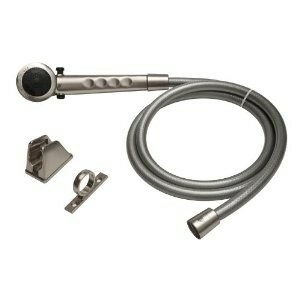 RV shower faucets are a simple upgrade that almost anyone can change. Why is this such a popular item to replace? 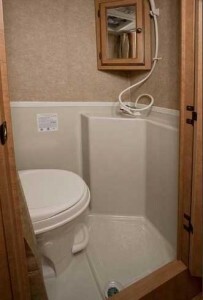 The truth is, most RV manufacturers skimp in the shower, knowing the new owner will most likely customize. Older shower heads may drip, rot or split early in the rig’s life. Most are plastic with little-to-no pressure. The good news is, there are some affordable, easy-install options. One of the most beloved RV shower faucet options is the Oxygenics and Dura Faucet. People love these things. (Read the reviews!) They increase your water pressure while at the same time using less water. (When dry camping or boon docking, water conservation is key!) When replacing your RV shower faucet, be sure to upgrade your water pressure regulator to be able to handle 85 psi. Without a good water pressure regulator (where you hook up to water) it’s impossible to have a good water flow. Drippy shower faucets are the number one complaint on RV forums. A Dura Faucet sells for around $25 on Amazon and comes in 5 color choices. An Oxygenics faucet starts at $50 and are also available on Amazon.com. Complete installation instructions are available on YouTube. Simply put, put in the term “RV Faucet” and surf. It’s like having a step by step, installation couch! 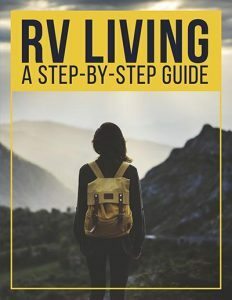 Now you are ready for your first big RV upgrade. RV sinks and RV faucets are available online. You can buy them from Amazon, Camping World or a variety of independent stores. Before buying, be sure to understand the store’s return policy. 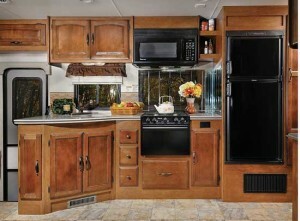 Upgrading any RV fixture can be full of unseen twists and turns. Make sure you can return anything that doesn’t work for your specific rig. RV forums provide a lot of DIY help. If you have questions about any point in the replacement process, post a new thread and ask for advice. RV’s have been around for a long time. There is always someone who has been there, done that and lived to tell the tale! Thanks for reading and don’t forget to share and comment below!